Heather Whitlow, the receptionist at MCSA, tried hard to avoid the camera when she caught me taking a photo of her changing the board in the lobby Tuesday at Muscatine Center for Social Action. She had yet to put Executive Director Maggie Curry’s name back on the board after moving things around to make room for my name. Muscatine Center for Social Action feels more like home with each passing day. 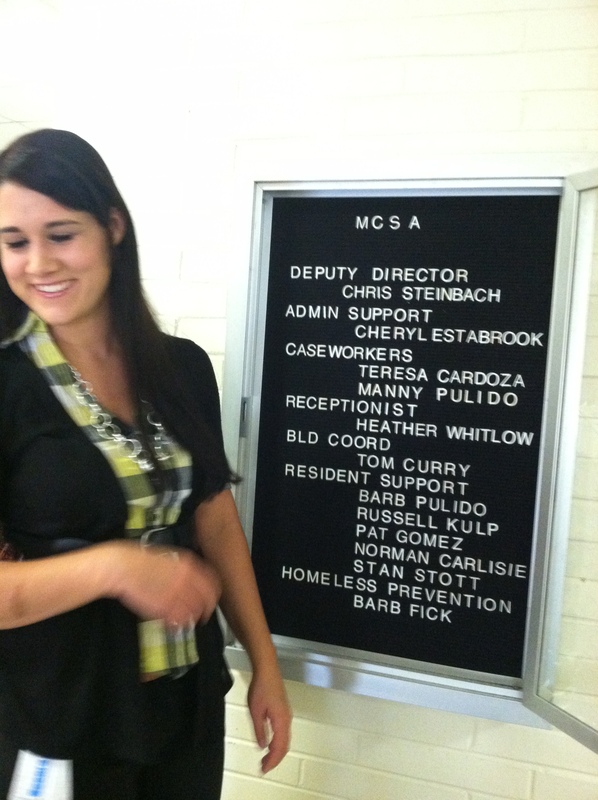 Tuesday, Heather Whitlow, one of my new co-workers, put my name up on the board in the lobby at MCSA. Today, I think I will get to move into my new office. It will be a day of moving around furniture, hooking up a computer and all of that fun stuff. I’ll try to remember to take some pictures. Longtime readers — those of you who started stopping by here back in March — may remember the last time I posted an office picture. 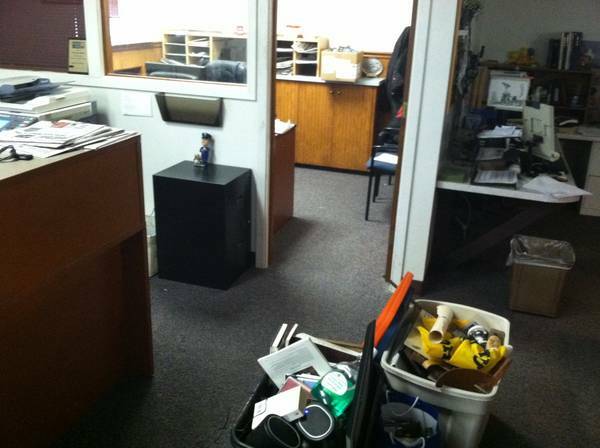 It was this rather sad image of stuff boxed up outside of my old office at the Muscatine Journal. That now seems like a long time ago. And I’m moving up: My new office is much bigger. It will have to be warmer this winter as well. It couldn’t be any colder. Life is looking better every day. Happy Halloween: I’ll be leading Connie Mann’s cycling class at 5:45 a.m. today at the Muscatine Community Y. Since it’s Halloween, I put together a themed playlist on Spotify. It will be the first early Wednesday cycling class this year for the Y’s fall and winter schedule. I just hope I’m not the only one who shows up. Speaking of music: I woke up this morning with this song by the Fabulous Thunderbirds in my head. Not sure what that means, but I just thought I’d share. More links: The New York Times has lifted the restrictions on its website pay wall, giving access of its Hurricane Sandy coverage to anyone who is interested. This is a great chance to read a lot of stories from the Times. If you are a word-o, you may join me in appreciating this column on verbs. Have a good one today. Stop by and see my new office if you are anywhere near Muscatine.